Hunting in Buncombe county is much different then rest of state. Lucky if you see a deer in a 2-3 day hunt. I have hunted this property going on 14 years and killed a few nice looking deer. On Opening day of rifle November 19th I had one game camera picture of him but decided he was much smaller oh boy was I wrong! However on opening day This deer showed up having no clue how big he really was I had seconds to make up my mind before I wasn’t going to have a shot on him again. I knew he was big for this area and a shooter. I shot he went down only 20 yards from where I shot him. 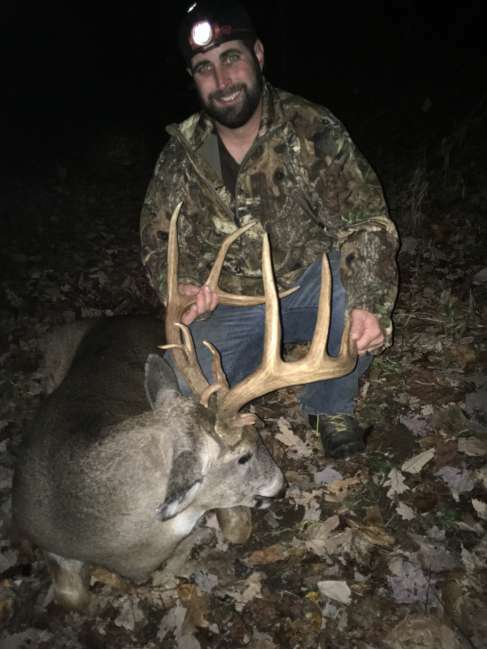 Then the rush hit me I knew this was a deer of a lifetime for our area. After watching him crash I waited a little extra to let my adrenaline calm back down. Then I walked up and low and behold it was a 12 pointer with lots of character.